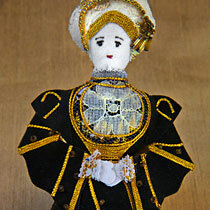 Handcrafted figure of Jane Seymour, the third wife of King Henry VIII of England. 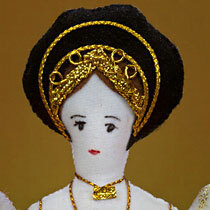 She is made with stuffed cloth and felt that is decorated with gold trim. 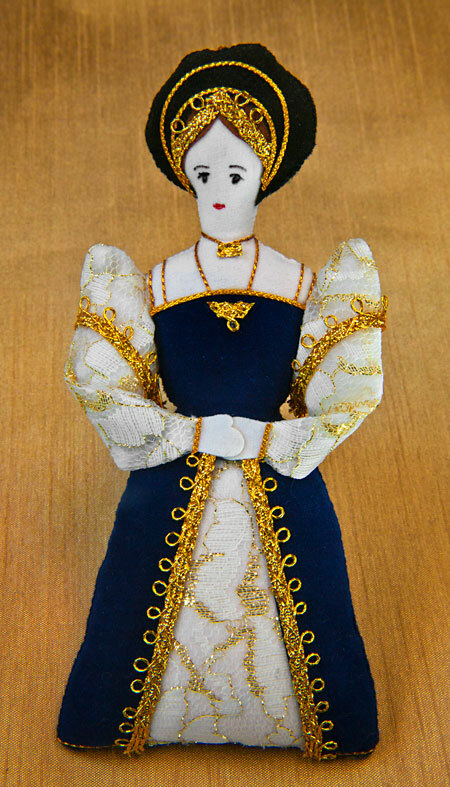 As a queen, she is dressed in a classically royal style, with decorative sleeves and jewels. Her facial features are created with pen on her face of felt. Jane is wearing garments customary for the British culture at that time. To learn more, read her story. I saw the flag being raised on the Tower of London, and I knew that the execution of Anne Boleyn was finished. 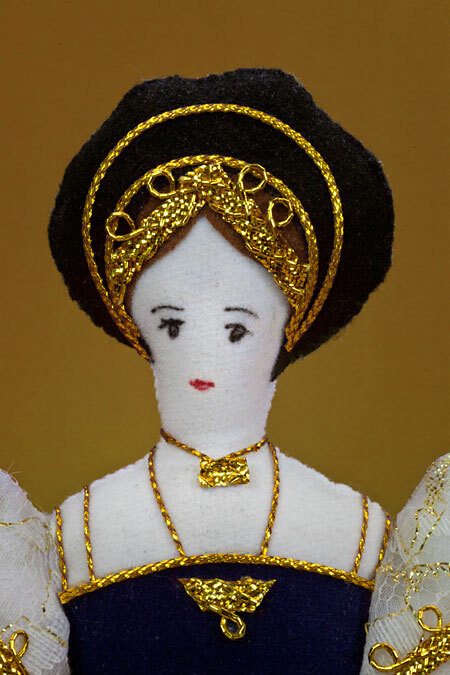 Now that King Henry VIII’s second wife was dead, I knew that I would be the next queen of England. 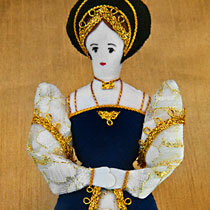 Henry and I were married less than two weeks after the beheading of Anne Boleyn. I was thrilled and scared all at the same time. It was great to be the Queen of England, yet I couldn’t help thinking about Henry’s first two wives. 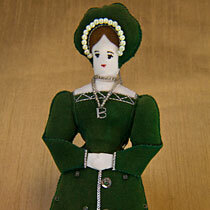 I didn’t know the first wife (Catherine), but I had been a lady-in-waiting (companion and servant) for Anne Boleyn. When Anne found out that the King liked me, she was furious. Since Anne was getting older and did not have a son, Henry decided to arrest her for treason. King Henry was very powerful, and the courts sentenced Anne Boleyn to death. Henry often told me that he loved me more than either of his first two wives. I wanted to give him a son, something he wanted so very much. About a year later, a baby boy was born. We named him Prince Edward, and Henry was thrilled! Henry began celebrating at court immediately. However, I was too sick to celebrate with him. I had a fever. I had tremendous pains in my abdomen. I felt cold and chilled throughout. As much as I wanted to live, I could feel my strength slowly leaving my body. The best doctors came to examine me, but they all left with little hope for my recovery. During the 12 days after the birth of our son, Henry was at my bedside urging me to live. He whispered in my ear that he would do anything in his power to save my life. But all his urging, all the doctors’ medicines, and all the prayers of the church could not save my life. Henry held my hand and with tears in his eyes told me how much he loved me. On the 24th of October, 1537, I closed my eyes for the last time. My death made King Henry very sad. He said that when he died he wanted his body to be buried next to mine. Ten years later (after three additional wives) King Henry died. Our son then became King Edward VI of England—he was Henry’s only son. Unfortunately, Edward was King for only five years before he died at the age of 15.